Many were fortunate enough to travel and enjoy a good education, spending time either in el Andalus or the wider Islamic community, before returning and living a life of relative isolation, though often within a Sufi social and spiritual framework of a specific community. Rarely did they ‘wander’ across Morocco. Another representation of Moroccan Saints is that provided by Michael Sugich in his Signs on the Horizons : Meetings with Men of Knowledge and Illumination book, where he ascribes ‘sainthood’ to people he has met throughout his lifetime who appear to have spiritual insight, power or authority. It is a fascinating account how impressions of great spirituality can often be conveyed by mere presence and silence, and in the most unlikely of people and situations. During several visits to Marrakech I had wanted to visit the shrines of the Seven Saints of Marrakesh but never did so; I had several free days at the end of my last visit in May and decided to locate them. Marrakesh is often known as the city of Sabatou Rijal, which literally means “seven men”. Its translation into English has become distorted into the “seven saints”. 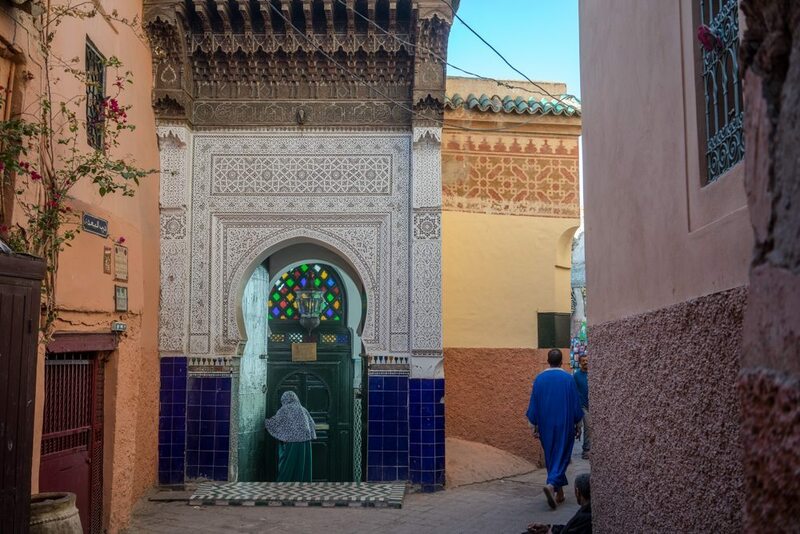 The seven men of Marrakesh are recognised as ‘awlya’ (plural of Wali); an Arabic word that refers to people who Allah has blessed with a special significance among Muslims. Marrakesh is home to the graves of over 200 awlya; Moulay Ismail ibn Sharif ( 1672–1727 and second ruler of the Alaouite dynasty ) established the pilgrimage to the tombs of the seven saints in the 17th century as a direct response to existing rites and pilgrimages in Essaouira, several hours away on the Atlantic coast. There the Regraga tribe, considered to be those people who introduced Islam to the region, were believed to contain a spiritual force called baraka. However Regraga also referred to a pilgrimage, existing still today, made annually each spring and lasting 40 days where pilgrims visit a series of local shrines of Saints around Essaouria, stopping at each shrine on the way. A holy tent made of fan palm fibres and dyed with henna is erected and a muqaddim (religious leader) riding a white horse joins the celebration. Moulay Ismail desired something similar in Marrakech and chose the seven men ( saints ) as a similar pilgrimage. 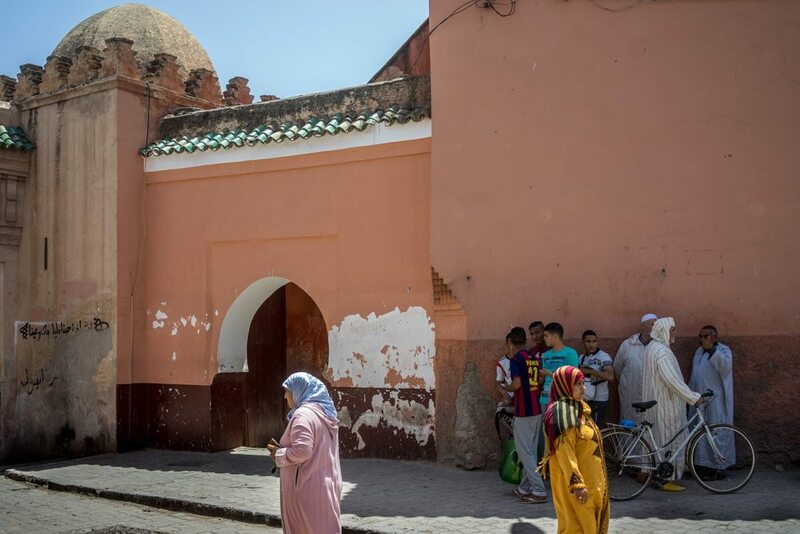 From that time Moroccans from all walks of life have visited the graves of the seven saints in Marrakesh to remember their lives and teachings. They are drawn to the idea that visiting these graves could heal their diseases, help them fulfill their wishes, and for spiritual sustenance. I was aware that I, as a non-muslim, probably could not enter the mauseleums where each body was buried, or memory maintained, but that did not deter me. In fact I was permitted to enter only one of the mauselums, that of Cadi Ayyad Ben Moussad. The mauseleum of Imam Souheili can only be reached through a muslim cemetery, and the police guarding that cemetery would not let me enter the cemetery to approach nor even photograph the green roofed building across the tombs. The photograph here I have ‘borrowed’ from another website also describing the pilgrimage. 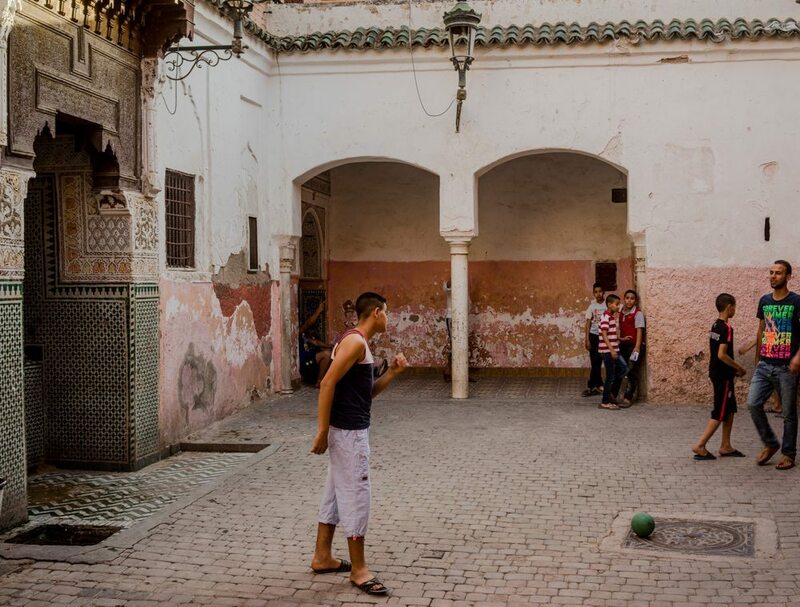 Youths playing football outside of Sidi Ben Slimane did not like my presence and immediately politely told me ( not asked me ) to leave. I returned to this site several times but again my presence was not wanted by young men at the shrine and I was encouraged, on one occasion with some animosity, to depart. When you enter a mosque where a saint is buried, perform two rak’at (cycles of prayer) with the intention of greeting the mosque. Visit the grave of the khalifah (successor) first and then the wali. [If his grave is also there]. Stand outside the grave in humility. Read surat al-Fatiha (once), astighfirullah (11 times), la ilaha illallah (11 times), surat al-Ikhlas (11 times), the last two surahs of the Qur’an (once each), surat al-Sharh (7 times), surat Ya-Seen (once), surat al-Mulk (once). Gift the reward of what you have read to the Prophet ﷺ, his family, the wali you are visiting and all other awliya. Make d’ua (supplication) and ask Allah for all your needs. Give charity to people around the grave because they are under the protection of the wali. His full name was Abou Yaacoub Ben Ali Assenhaji. He was born in Marrakesh and never left it all his life. He was nicknamed “Moul L Ghar”, or the “Cave Man”. When he was still young, he was afflicted with leprosy and would lose parts of his body, causing people flee from him in fear of contracting the disease. His family, on the other hand, expelled him out of fear of the virus. Afterwards, he went to live in a cave in a deserted place near Marrakesh. Locals expected him to die any moment, but Sidi Youssef Ben Ali surprised them all and survived for a long time. People started talking about his power to resist hunger and disease, and they began visiting him in the cave to receive guidance and help them solve their problems. Death: 1196 (593 in Hegira). Qadi Iyad ibn Musa was born in 1083 in Ceuta, then belonging to the Almoravid Empire. He was the great imam of that city and, later, a high judge in Granada. As a scion of a notable scholarly family, Iyad was able to learn from the best teachers Ceuta had to offer. Qadi Iyad benefited from the high number of scholars in al-Andalus, the Maghrib, and the eastern Islamic world. He became a prestigious scholar in his own right, and won the support of the highest levels of society. Born in Ceuta in 1129, Belabbas Ahmed Sebti is the most important of the Seven Saints, and is sometimes referred to as the Patron Saint of Marrakech. It’s been said that his father died when he was still a teenager, and then his mother sent him to work. 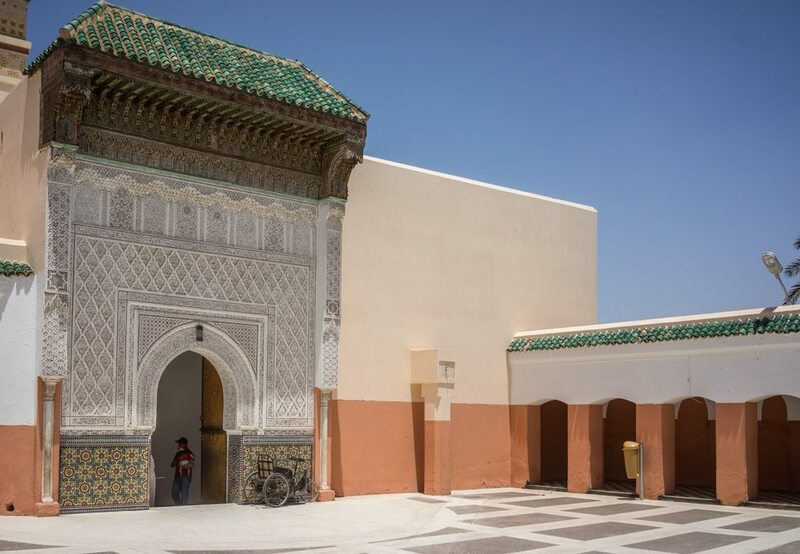 However, his obsession with his studies prompted him to occasionally escape his work in order to attend the classes of Sheikh Abi Abdellah Mohamed Lfakhar in the mosque. His mother, on the other hand, kept punishing him and sending him back to work, until the Sheikh intervened and suggested giving his mother money in order to let her child study. Sidi Bel Abbas was a great patron of the poor and particularly the blind in the twelfth century. Even today, food for the poor is distributed regularly at his tomb. He died in 1204 and is buried at Sidi Marouk cemetary, near Bab Taghzout. Also known as: Sidi Mohammed ben Slimane ben Said al Jazouli. Abu Abdullah Muhammad al Jazuli was born in a village called Jazoula in Sous Massa Daraa in the 15th century. Nobody knows the exact year of his birth. Historians say he descended from Ali Ibno Abi Talib. Imam al-Jazouli is better remembered as a character of legend rather than a real human being. “Imam al-Jazuli”, was a Moroccan Sufi leader of the Berber tribe of the Jazulah. He is best known for compiling the Dala’il al-Khayrat, an extremely popular Muslim prayer book. The book is divided into 7 sections for each day of the week. In June 1465, he collapsed and died while performing his Subh prayer. Because of the suddenness of his death, it was rumored that he was poisoned. His body was buried near Essaouira. 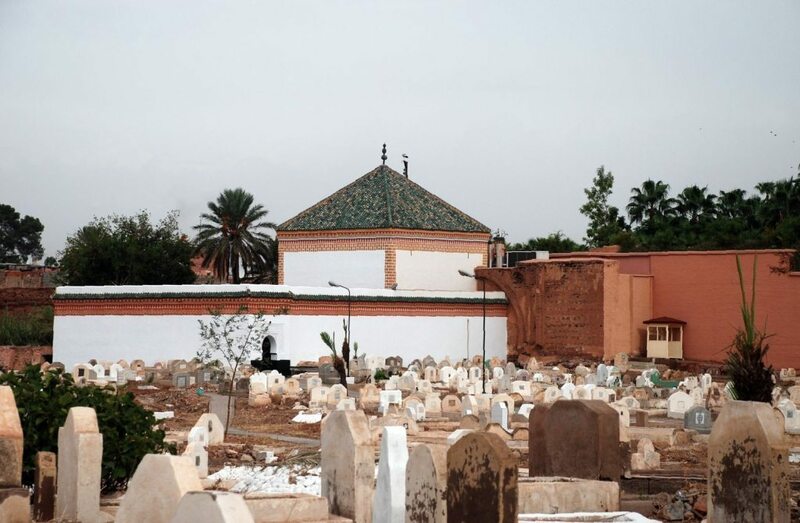 Seventy-seven years after his death, his body was exhumed to be transferred to Marrakech where rests at the zaouïa Jazoulia in the north end of the medina, near Dar-el-Glaoui. Also known as: Abou Fares Abdelaziz. Sidi Abd El Aziz was a fifteenth century theologian. 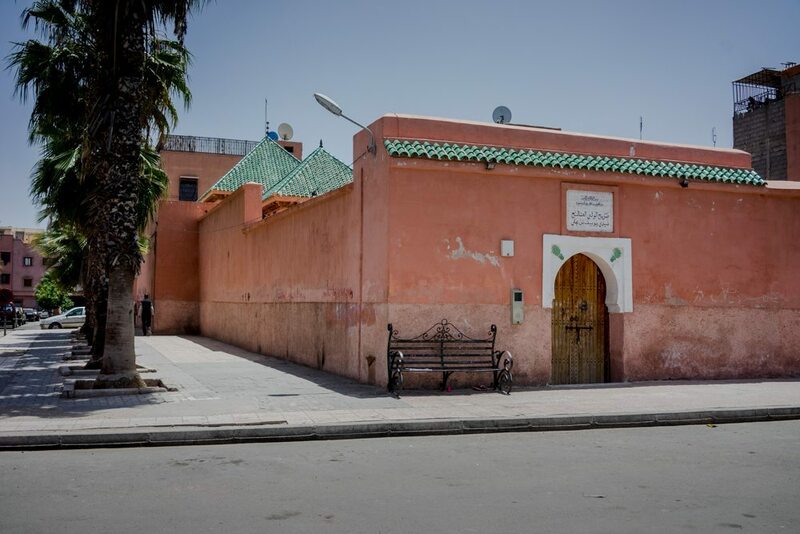 His mausoleum is very near to Rue Baroudiyine, a short walk from Marrakesh Riad Cinnamon. He was born in Marrakesh, and was illiterate during his youth. However, he later made a name for himself in Fez at the Medersat el Attarine, where he was the spiritual successor of Imam el Jazouli. He died in 1508 and was buried in Marrakesh. It is a local tradition for women to visit his grave, drawn to the idea that he can heal their fertility and facilitate childbirth. He is buried near Ben Youssef Mosque. Origins: Originally from the Gazoune tribe. After having completed his studies in Fes, he went on to study in Grenada, before relocating to Marrakech to complete his training under Sidi Abdelaziz Tabaa. Sultan Sidi Mohamed Cheikh incarcinated him in Marrakech, jealous of his positive reputation with the people. He was freed several years later. Buried: He’s buried near Mouassine Mosque. Imam Abderahim Souhaili was born blind in 1114 near Malaga. He grew up in a poor, but religious and well-educated family. His father taught him Arabic and helped him memorize the Quran. Afterwards, he was taught other sciences by the famous scholars of that time, in Malaga and other cities in Andalusia. Yacoub El Mansour brought him to Marrakech from Spain. He’s known for his Sufi poetry and his openness during a time of strong religious censureship. Students often gather around his grave. He’s written two masterpieces: one about the names of the Prophets cited in the Koran and the other a biography of Sidna Mohammed. 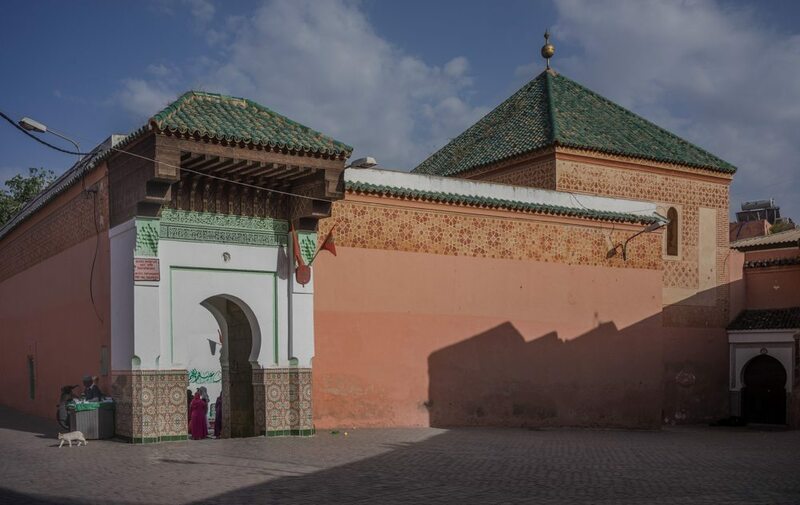 He died in 1185 in Marrakesh, and was buried in Bab er Robb, a southern gate of the city of Marrakesh, near Bab Agnaou.